You didn’t see it coming and couldn’t have prepared for it. It was a phone call or a frantic trip to the emergency room or the authorities knocking on your door and, suddenly, your child or another loved one has died. Suddenly, you find yourself lost in the valley of grief. The loss of your loved one quickly fills your days with incomprehensible duties; calling relatives and friends with the dreadful news, planning a funeral and Heaven help you when it’s time to go back to work. Grief can hijack your mind, forcing you to watch repeated replays of the traumatic “mental movies” of the last time you saw them or the place and time when you received the dreadful news. Maybe you’re beating yourself up over regrets from the past or wrestling with the idea of having to accept a future without your loved one. Maybe you find yourself watching helplessly as your family members slowly fade into mere shadows of themselves as they struggle to deal with their grief. It’s normal to feel powerless and ill-equipped to deal with grief because, unfortunately, most folks aren’t prepared for the devastating experience of losing a loved one. Dealing with grief isn’t something we normally talk about. If you’re like me, when my 22-year old son died, I was willing to do the work…I was just having trouble finding someone to show me HOW! So, I did the only thing I knew how to do – I did research! I scoured the internet. I read dozens of books. I talked with local grief experts. I hired personal coaches. Everyone seemed to have an idea or two that was helpful, but I wanted an action plan. Call me impatient, but I wasn’t going to be satisfied with merely ‘understanding’ the grieving process or waiting to see if “time” alone would heal my broken heart. I made it my goal to figure out this grieving thing and to share whatever I found to be helpful with my clients. 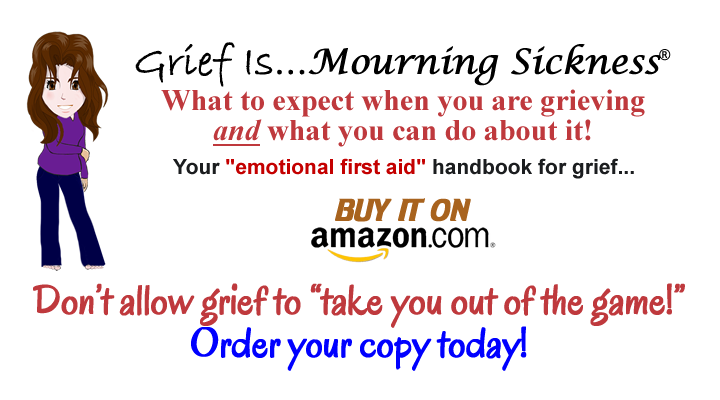 The result: I’ve compiled the ideas, stories – and some action steps – that have proven to be helpful in my book, Grief Is…Mourning Sickness, an “emotional first aid” handbook just for you! I named it Grief Is…Mourning Sickness® because that was my first insight as a grieving Mom. Grief Is…Mourning Sickness is a quick read – most people tell me they’ve easily read it in one sitting. In the introduction, I model how I took inventory on my own life. I was determined to be completely transparent about the numerous traumas, losses and changes I’ve personally experienced. I consciously decided to bare my soul (scary) so you could see that I don’t pretend to be anything but your average “Jan”…a real person who’s been there, suffered and struggled and figured out some things that work. So, I’m really hoping you’ll sense how much I want to help. Each chapter in the book begins with an insight about the grief experience. I then take that insight and model it, through story, to show how it’s been helpful for me and my real life clients. You’ll learn additional life skills in each chapter along with healing suggestions and exercises specific to your grief recovery. The last chapter is an introduction to The 5 Aspects of Grief. Many of my clients tell me that just having this practical understanding of the aspects of grief has given them great patience with their own process. Obviously, I don’t know about your loss, where you are in your grieving process or even if you know what you need right now. I know I didn’t have any idea what I was in for when I started consciously addressing my grief. I muddled along, in part; inspired by the idea that maybe, just maybe, I could help someone like you by sharing what I was learning. IMPORTANT MEDICAL DISCLAIMER: The information contained in or made available through this website and our services is NOT INTENDED or IMPLIED to be a substitute for professional medical advice, diagnosis or treatment. All content - including text, graphics, images and information - contained on or available through this website is for general information purposes only. Please see a medical professional if you need help with depression, illness, or have any concerns whatsoever. WE DO NOT OFFER MEDICAL ADVICE, COURSE OF TREATMENT, DIAGNOSIS OR ANY OTHER OPINION on your conditions or treatment options. SERVICES OR PRODUCTS THAT YOU OBTAIN THROUGH THIS WEBSITE are for information purposes only and not offered as medical or psychological advice, guidance or treatment. You may or may not experience anything from our sessions and/or the services provided by teachers, speakers and guests. Please consult a medical professional if you are experiencing illness, depression, anxiety, mood swings or any concerns whatsoever. The services on this website have not been evaluated by the Food and Drug Administration and our products and services are not intended to diagnose, treat, cure or prevent any disease. Your results when participating in our sessions and programs may vary. IMPORTANT FINANCIAL DISCLAIMER: The information contained in or made available through this website and our services cannot replace or substitute for the services of trained professionals in any field, including, but not limited to, mental, financial, medical, psychological, sales or legal fields. We do not offer any professional, medical, financial or legal advice and none of the information contained in the website and our programs should be confused as such advice. The information we provide on this website and in our sessions and programs is provided for educational and informational purposes only, without any express or implied warranty of any kind, including warranties of accuracy, completeness, or fitness for any particular purpose. Your use of this information is AT YOUR OWN RISK. YOU SHOULD NOT MAKE ANY FINANCIAL DECISION BASED ON ANY OF THE INFORMATION PRESENTED WITHOUT UNDERTAKING INDEPENDENT DUE DILIGENCE AND CONSULTING A PROFESSIONAL FINANCIAL ADVISOR. Success stories and financial results from the use of EFT and/or TETT are provided as examples and are not intended as guarantees. Your results when participating in our sessions and programs may vary. CONSUMER NOTICE: You should assume that Jan Luther and The Rejuvenation Station, LLC, have an affiliate relationship and/or another material connection to the providers of goods and services that may be mentioned in this website and that we may be compensated when you purchase from one of those providers. You should always perform due diligence before buying goods or services from anyone via the Internet or offline.